In these times, when the country demands papers to prove citizenship for our highest political officer, this indigenous poet says "No, I claim not to be an American, not by their definition." These poems are a long time coming: part indictment, part elegy, part rant and all truth. They address invasion as infection and possession as foreign to those dispossessed. More importantly, these poems speak to "the resilience of the old ways and of our blood." Thomas Hubbard's poems evoke the struggle to keep the Old Way alive, despite destruction and seduction by so-called "Mainstream Society." Combative, courageous and compelling, this collection wins its way through to a straightforward optimism … Raining again, but/never enough to erase the invasion/the greed, the lies... nor the certainty/their walls will crumble with time, and/this injured world will heal. Thomas' poetry embodies and explores the conundrum that so many Turtle Island peoples are born into and struggle with every single day and night of their existence. This is the challenge of "walking in two worlds," the old Indian path and the imposed super highway of the first invaders who remain with us in their current guise of big banks, corporations, and war mongers. The chapbook's title itself serves as an entryway into what has happened to Indian people, because so many of us are bereft of our original languages. 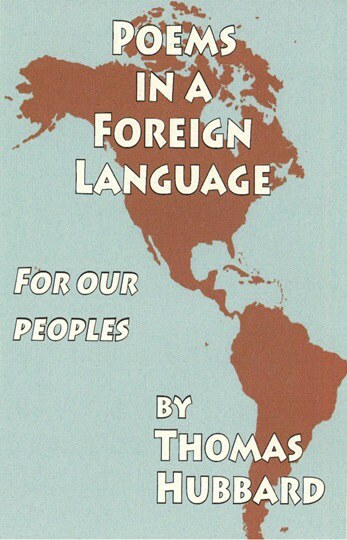 Thomas sets forth what a theft this has been in his title poem and throughout the book, how speaking and thinking in a foreign language, English, has kidnapped us from our former words that once fashioned our very minds, hearts, dreams and visions. Our long ago love. has killed so many of our people. would have done us even worse. always got along very well. now, paths stretch far behind me. discuss the old way, tell how it is. walking through this curious world. because I'm an old man, and it is time. 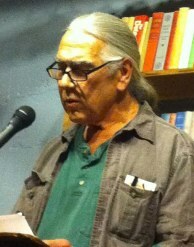 Since retirement from teaching in the Tulalip Reservation's Heritage High School, Thomas Hubbard has written essays and interviews and edited for Raven Chronicles and Cartier Street Review magazines, and featured in many Pacific Northwest spoken word venues. His poems and short stories have appeared in Yellow Medicine Review, Red Ink, and Florida Review, and he reviews books for various publications. A mixed-blood of Miami, Cherokee and (probably) Irish lineage, Thomas has always been a traveler, beginning in his late teens with hitchhiking adventures all around the USA. These days he rambles back and forth between the Ozarks and the Pacific Northwest, the country of his heart. POEMS IN A FOREIGN LANGUAGE is a 40 page hand-sewn chapbook - $10.00.